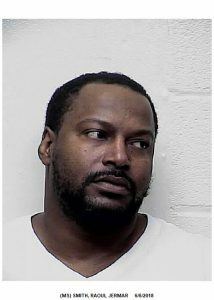 The Washington County Sheriff’s Office has charged a man in connection to a shooting which occurred on May 15, 2018 in Funkstown, Maryland. Reckless Endangerment, Illegal Possession of Ammo Firearm Use/Felon-Violent Crime, Regulated Firearm Illegal Possession, Handgun on Person and Malicious Destruction of Property. Through their investigation and review of security footage from the area, Detectives determined the shooting stemmed from an altercation that began at Joker’s Bar and Grill, located at 2 West Baltimore Street, Funkstown. Detectives obtained surveillance footage which shows Smith firing four rounds from a handgun as he chases a van containing other parties from the initial confrontation out of Funkstown. No one was injured as a result of the gunshots; however, the van was struck. Smith is currently being held at the Washington County Detention Center on no bond.